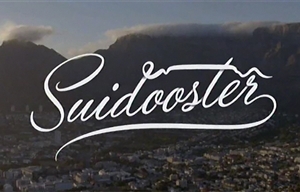 Suidooster is a South African television soap opera produced by Suidooster Films which revolves around a matriarch, her family, friends and the people of Suidooster, a small shopping and business centre in the fictional Cape Town suburb of Ruiterbosch. Three families that live and work there inevitably share their joys, sorrows, disputes, romances, revenges and retaliations, misunderstandings, and jealousies, but it is also the story of a multicultural South African community. As the series begins, Mrs J's (Theresa Sedras) long-lost daughter, Lee-Ann (Portia Joel), comes home after having been away for many years. Mrs J's older daughter, Bridgette (Denise Newman), is unhappy about this for various reasons, and she does everything in her power to get rid of Lee-Ann. In the meantime, Bridgette's husband and property magnate Ian October (Abduraghmaan Adams) is working on a devious plan that threatens the Suidooster community, which includes Uncle Fasie's (Johan Botha) Oos Wes Restaurant, the Aalwyn Apteek, and Suidooster Eiendomme Bpk. On the other side of the spectrum, the Samsodiens own and manage the chemist in the Suidooster centre. Initially their lives seem perfect, but their world falls apart when the presence of Bianca Fourie (Simone Biscombe), Oos Wes' new waitress, opens an old wound. We also have the Du Plooy family who cannot seem to escape the hold that Ian October has over them. When Chris Du Plooy's (Marcel van Heerden) son, Tim (Marco Spaumer), starts working for Ian, their lives take a new turn. Throw in some family from Gauteng (Stefan and Michelle Gerber, played by Gideon Lombard and Greta Pietersen) who have had to come and live with Du Plooy family indefinitely, and you have a bomb that could go off at any time. Produced by Suidooster Films, the executive producers at the start of the series were Bradley Joshua and Jaco Loubser, with Kaye-Ann Williams the supervising producer for kykNET. Nosipho Dumisa and Paul Venter were producers and early directors included Heleni Handt, Romano Gorlei and Shirley Ellis. Rosa Keet is the head writer and the theme song is by Alistair Izobell. Season 1 originally aired on kykNET and kykNET & kie from Mondays to Wednesdays at 18h00. An extra episode per week was added (Thursdays) from the week starting on Monday 4 July, 2016. Justin is in trouble...ALSO: Stefan's trial begins. Netflix delivers a breath of fresh air for our TV industry with this new teen drama from the producers of danZ!, Nommer 37 and Suidooster. Why is the community in mourning? And a love triangle involving Chelsea-Kate!